Hardcover with light shelfwear to edges and boards. DJ protected with mylar and not clipped. Pages tight and clean. Library discard with usual marks and attachments. Pocket removed. 170 pages.It is a calm, untroubled day in 1868. The beloved Queen Victoria is traveling by train to Ayrshire, to unveil yet another memorial to her late husband Albert. Yet certain unseemly activities on this otherwise placid day-the cutting of telegraph-wires on the Queen's route and the doping of her sergeant-footman-convince two of Victoria's loyal subjects that something unspeakable is afoot. 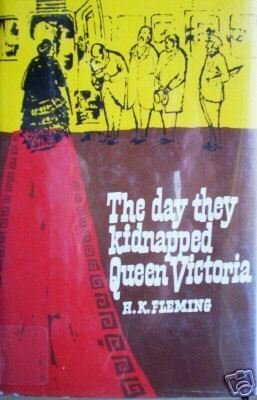 Someone is planning to kidnap Queen Victoria.Visit our eCRATER store forother greatNovels and save on shipping!Most books haveshelf wear and cover scuffing. Binding is tight. Actual covers may be different than stock photos. Pages may be yellowed due to books age. If condition is important, please ask for a more detailed description.INTERNATIONALSHIPPING: We ship worldwide for actual postage plus $1.75 handling. International buyers must contact me for final costs before making payment.We only accept PayPal for International orders.Pay me securely with any major credit card through PayPal!